Nick Ward headed up Weston Canyon during the 2015 Cache Gran Fondo. 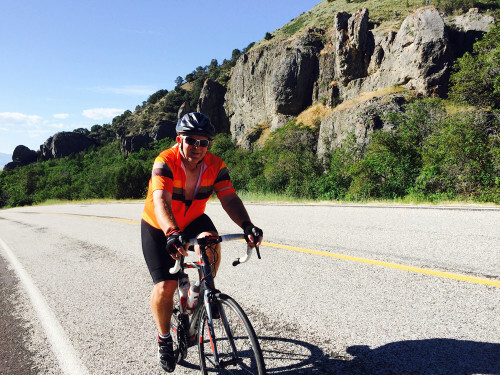 July 4, 2016 – The Cache Gran Fondo, one of Utah's premier gran fondo events for citizen riders will take place on Saturday, July 9, 2016 in Logan, Utah. The event will also host the Utah State Masters Road Race Championships (separate start, road race), which is not part of the gran fondo. The Gran Fondo is open to everyone, and features either a 56 mile course, or a 100 mile course and starts at the Logan Regional Hospital at 6:30 am. The ride funds breast cancer screenings for uninsured women in Cache County. 2) We will turn the racers at the Benson Marina turn off (about mile 35), and come into Logan from the NORTH. 3) Heritage Dodge will be providing Lead Cars and SAG/Wheel cars, along with Cache Co. Sheriff motos to manage intersections for the race portion. 4) Different Finish Line – Racers will finish on their own finish line, separate from the 100 North finish line for the Cache Gran Fondo riders. The only time you will cross paths is going into the food area or beer reception (on foot). 5) Based on the numbers so far, we may only have one or two starting groups (but will prize separately). There are still more prizes than riders. 7) Masters Championships restrict CAT 5s – HOWEVER, we have an OPEN CAT, and the Gran Fondo will prize it heavily (remember Bear Lake Classic – many of the CAT5s took home items). 9) Breakfast, lunch included. T-shirt, finisher's medal, free photos, packet pickup in Bountiful and Logan (and day-of), ice cream, etc. PS – we have NEVER had bad weather in the 5 years of the event…maybe a little wind…but nothin but blue skies!